Vernacular, Indigenous and Tribal Architecture? How are cultural values represented within the built environment? Etymology of the term ‘Vernacular’ originates from early 17th century Latin ‘ meaning ‘vernaculus ‘domestic, native’ (from verna ‘home-born slave’). It has many interpretations and criteria when it comes to architecture, but the basic and general definition of vernacular is derived from the language or dialect spoken by ordinary people in a particular country or region. From an architectural perspective, vernacular vocabulary therefore means domestic and functional rather than large, classical monumental buildings traditionally built by trained architects. In the Encyclopedia of Vernacular Architecture of the World (Oliver:1992) defines vernacular architecture as structures built by and for the people. “Comprising the dwellings and all other buildings of the people. Related to their environmental contexts and available resources they are customarily owner- or community-built, utilising traditional technologies. All forms of vernacular architecture are built to meet specific needs, accommodating the values, economies and ways of life of the cultures that produce them”. “Folk building growing in response to actual needs, fitted into environment by people who knew no better than to fit them with native feeling”. In his publication Dwellings (1997), Oliver further insists “if it is built by architects, the ones that consciously design a building; the complication, theories and process of today’s modern structures indicate that architecture can no longer be called vernacular”. The photograph above is an excellent cultural example of vernacular architecture heritage from Karaikudi, in the region of Chettinad, Tamil Nadu, South India. 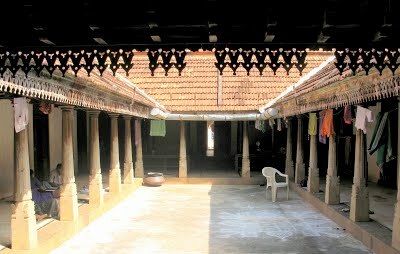 The large, internal courtyard ‘nalukettu’ is integral to the dwelling, and the size a specific privilege of the upper caste Hindu Chettiyar householders. This ‘open to sky’ space is suitable for a range of joint family community activities that take place. This ranges from domestic chores, to ritual marriage ceremonies, and the artistic Kolam floor designs. 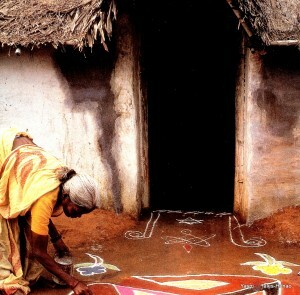 The Kolam is a decorative pattern produced by all Hindu Tamil women, irrespective of caste, on a daily basis in white or coloured chalk on the threshold of the domestic house. This becomes more elaborate during the annual Pongal harvest rice festival as visually illustrated on the right hand side of the Chettiyar courtyard floor. The South Indian Chettiyars were rich traders in SE Asia, particularly Burma, and much of their architecture has beautifully carved wooden decorative eaves which edge the sloping tiled roof,designed to drain and collect rainwater. Notably the inner walls of these houses are plastered with lime mixed with egg white to get a cool but shiny and smooth surface. In contrast many of the internal stone pillars are marble due to commercial trade with Italians or wooden Burmese teak, and some still retain Venetian stained glass windows and crystal chandeliers. The ancestral Chettiyar dwelling is merged with historical cultural traditions using permanent ‘pucca or pukka’ building materials. The architectural vocabulary of these South Indian houses thus combines European influences to produce a unique heritage in an Indian vernacular regional style. Ironically due to the high maintenance of these properties, many families are now demolishing or neglecting their houses which has resulted in the Indian government converting these beautiful homes into 5* luxury hotels for the tourist market. Pukka ( in Hindi पक्का, Urdu پكّا‬ pakkā) is a word of Hindi and Urdu origin literally meaning “cooked, ripe” and figuratively “fully formed”, “solid”, “permanent”. In Britain, the linguistic slang term (note of Hindi origin) is often use to describe a ‘pukka bloke’ meaning a “genuine” or “solid man”; derived from the stiff upper lip of the Colonial inspired pukka sahib. Pukka buildings or dwellings are therefore designed to be permanent, stable and solid structures. In contrast much indigenous architecture in India can be located among the Tribal groups of Northern and Central India where the styles, shapes, sizes, entrances and exits will vary from region to region depending on the climate. Buildings may form longhouses and square houses, houses built on platforms, and houses built on plinths with thatched and conical roofs. These domestic spaces are distinct and reflect the beliefs and cultural identity of each tribal group, and may collectively house up to 80 people or clans. Tribal architecture is not Pukka but defined as Kacha, built by local people using impermanent building materials such as mud, grass, fibre, or semi-permanent wood, coconut or palm frond. Kacha architecture is replaced on an annual or seasonal basis as is therefore a short lived dwelling without stability or endurance, that constantly requires replacement. However, the advantage is the traditional building materials are readily available from the land, they are cheap and low maintenance, but interestingly the indigenous walls and floors equally reflect a strong form of regional decorative embellishment. Architecturally, these tribal, vernacular dwellings have not traditionally been studied in contrast to European classical architectural styles. Tribal architecture was often regarded as backwards and primitive, associated with underdeveloped far flung societies which became a cultural metaphor for the people (Oliver:1992). Over the last three decades (since the 1970’s) there has finally been a dialogue between architects and anthropologists to explore how the fundamental use of space and place relates to the building material and cultural meanings of vernacular dwellings and tribal settlements. Shelter is a universal need, and globally theorists are now exploring how cultural values are reflected through the built environment to provide a sense of identity for the local community. For further related topics do see my blog post on the Anthropology of Space and Place. http://www.talkingstreets.co.uk/2018/09/05/anthropology-of-space/, and for a wider global discussion of indigenous architecture see https://en.wikipedia.org/wiki/Indigenous_architecture.